Little Star Illustrations by Stella Kearns. 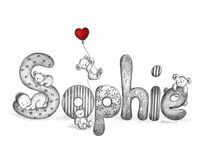 Personalised and unique original baby and child hand drawn names. 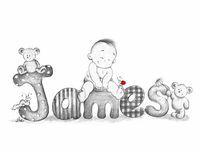 The perfect gift for a new baby, christening, birthday or any special occasion. A timeless gift to be treasured for a lifetime! Stella has been an illustrator for over thirty years, starting out in some of Irelands well known animation studios – Brown Bag Films, Emerald city Productions, Sullivan Bluth, Murakami – Wolf Productions and Caboom to name a few. She was trained in the art of animation, character design and all aspects of bringing animation characters to life. Stella still works and develops her little characters as she would for animation, beginning with rough blue pencil sketches. Original Art or Mounted and Framed Prints Available.